A Passion for Small Paintings: Back to Tuscany Again and Again to Teach Painting Workshops! Back to Tuscany Again and Again to Teach Painting Workshops! 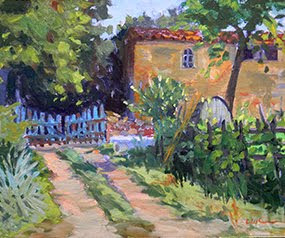 Spannocchia - Plein Air Painting in Oils - June 28 - July 6 - in Tuscany near Siena, Italy. $2500 per person single. $2300 per person double. Labels: plein air painting in Tuscany. Good news.Hope you have good time there.For a lifetime experience of river rafting visit River rafting in Rishikesh. Would you like to receive my small painting images via email? Please enter your email address below. More information will be posted this fall. I can accept credit cards safely. No Paypal account necessary.